Latest news, updates and current work in progress. Bookmark this page for the latest updates. 08/07/2018 - MDB Viewer Plus 2.61 released. Form view fix and some slight improvements to the table design feature. 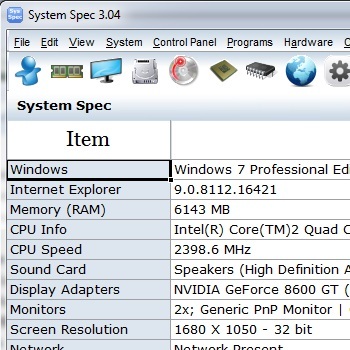 This is an important new release of System Spec. I have improved the internal working for the way it displays and manages the different categories of system information. I have fixed a few bugs including the annoying bug of Windows 10 machines being reported as either 8 or 6.2. I have added a new icon at the beginning of the tool bar labelled menu. 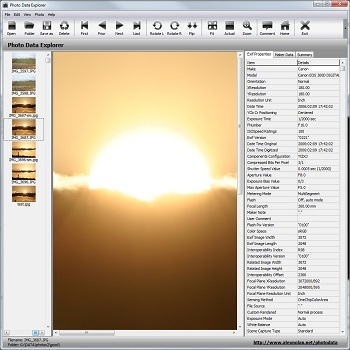 This opens up the menu tab which contains all the same icons that are displayed on the tool bar. 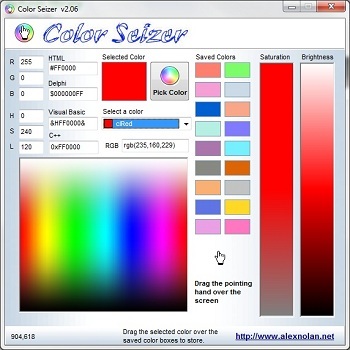 This menu will replace the tool bar for accessing the different categories of information. It can be filter at the top of the screen to make it easier to find things. This screen will allow me to add many many more groups of information as I think of them as it is not limited for space as the main tool bar is. For this release I have left the section icons on the main tool bar but they will be removed in future releases if user like the new menu. This is the maintenance release to fix a few issues that have come up as a result of all the major alterations of version 2.58. I have improved the recent dialogue window a little. There will be another maintenance release in another couple of days. 2.58 has taken a while to release. It has basically had the guts ripped out of it and re-organised. The tables are now open from the tables list instead of a row of tabs under a tables tab. This makes each table open as it's own instance just like the query tabs. On the main tool bar I have moved a lot of the table related buttons to the new table tabs. Although these changes do not sound like much it actually makes a big difference. The overall interface is now much simpler and more dynamic. It makes more sense this way. Because of the major heart surgery I have performed on this tool there may be more bugs than a bait store. Please email me any bugs you find. Don't worry that they might have already been reported it will give me and idea of which bugs are the most critical. I will be releasing a new version in a couple of days as a maintenance release. Not a software update this but as we're in the bee swarm season here in the UK. I was going for a walk with some colleges in the woods the other lunch time and I heard a swarm of bees. After a while I saw them high up in a tree. This reminded me that I must put a page on my website for I am a registered beekeeper and I do collect bee swarms and give them a safe home in my apiary. This a maintenance release to fix a few errors. The main new feature of this release is the new ability to split tabs to right side. This allows you to see the contents of any two tabs at the same time with a splitter bar between them for resizing. You do this by right clicking on a tab and selecting the new option labelled 'Move tab to other view'. This will move the tab to a now visible grouping on the right side as all tabs are on the left side by default. To move a tab back repeat the process from the right side. 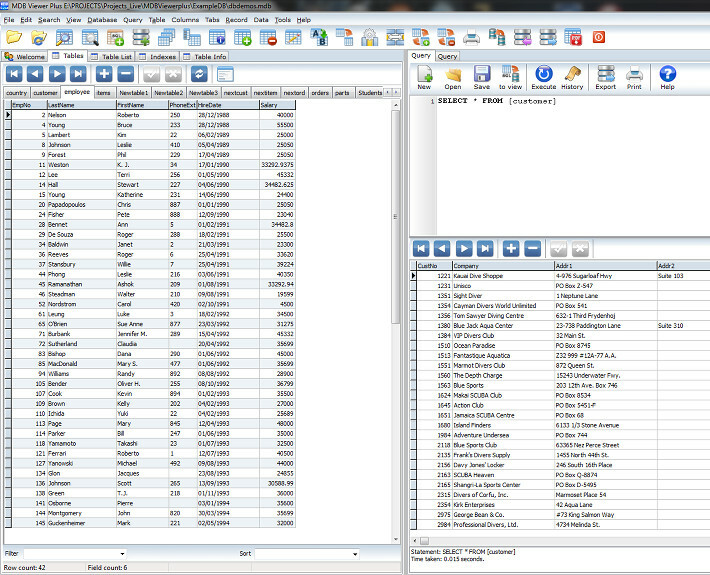 The 'Table List','Table Info' and 'Indexes' screens are now opened as tabs instead of embedded into the tables screen. They can therefore also be move to right side tab grouping if desired. There is currently no shortcut key defined for moving tabs but I may add one if needed to the next version released. There are a few bugs fixed in this release as well. If you find any bugs or receive an error email me the details plus the error log. I've still got lots to do with this tool so keep an eye out for new releases. 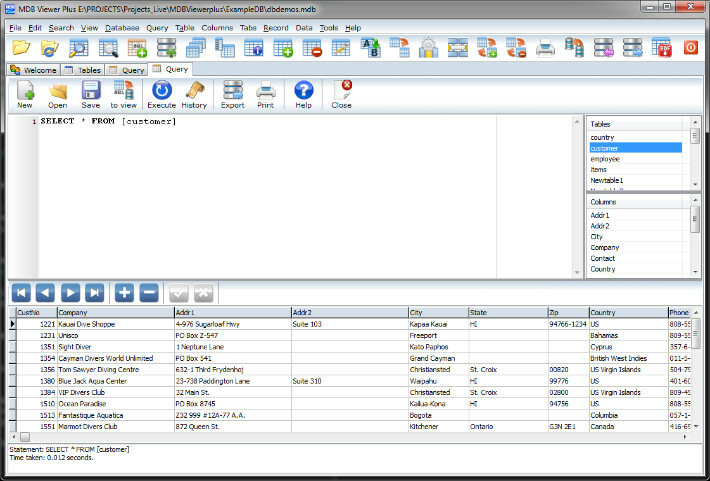 In this new version of MDB Viewer Plus the main change has been to rewrite the Query window. Although it may look roughly the same, the inner workings have changed alot. When clicking the query button on the main toolbar the query window opens as a tab along the top next to tables and welcome tabs instead of within a static query tab in previous versions. If you click the query button a second time you get another instance of the query window next to the first. This behaviour in the most important change in this update. Previously you could open up new query tables within the query window but each tab was sharing the results grid. This meant you had to re-execute the query everytime you changed tabs. Now each query tab is it's on instance and therefore has it's own results grid. 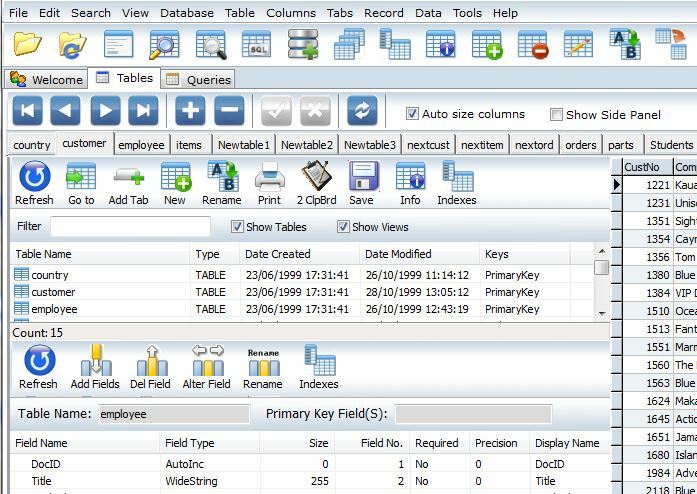 The tree on the right side of the query window has been replaced to two linked grids displaying table names and field names for the select table. 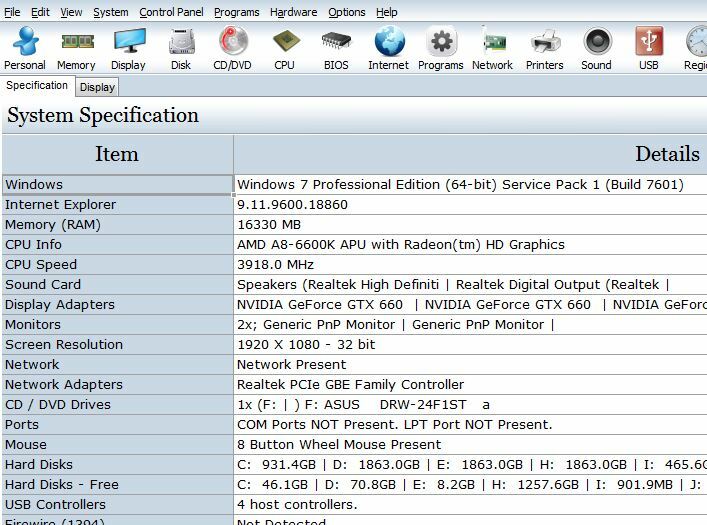 By right clicking on the tables list presents a menu of option to assist building queries. I will be adding more to this menu in future versions. The other change I have finally been able to make is getting shortcut key F5 to re-execute which ever query window is active. The SQL button icon on the main tool bar has changed colour to reflect the icon shown when a new query window is launched. 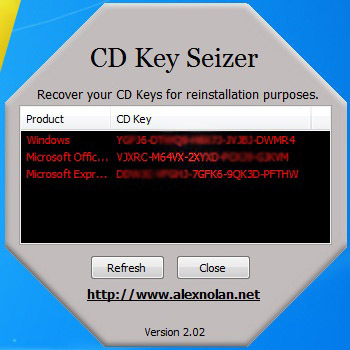 This overdue version has improved compatibility with Windows 10 as well as fixes a few issues. The various information windows are now displayed as tabs to make it easier to switch between. To close the tab simply click the tool bar button again. I have added captions to the tool bar making it clearer what each one does. You can see the new interface changes in the screenshot below. 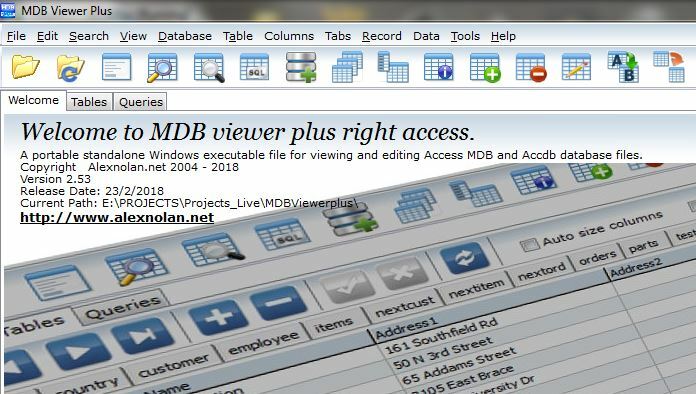 This version of MDB Viewer Plus is very much a maintenance release. I have put error traps on all toolbar buttons that require a database to be open first. I have also corrected and fixed the keyboard shortcuts keys that have been clashing with each other or not working. The only altered functionality is the recent openned file dialog. This dialog is now in a grid format and allows you to move a recent item up or down in the list. A big thankyou to the individuals that have kindly donated towards this tool. I have listed the donators for this version period in the about box. In this version of MDB Viewer Plus I have now made the 'Table Info' dialogue dock underneath the table list dialogue which in previous versions was floating window. As in every new release there is also a number of minor correction, alterations and bug fixes. The query dialogue has now been changed to open as a tab under the new 'Queries' tab. I am contemplating whether to remove query tabs internally to that dialogue and have them open as seperate tabs under the main 'Queries' tab. For those of you who prefer to open a query as a floating window there is now an additional option under the search menu labelled 'Open in Window'. I have changed the icon on the main toolbar for the queries. A new feature of the query dialogue / tab is the 'Save as view' function which allows you to save a select query into the database as a view. You are prompted for a name and then this view is then listed in the tables list as a view. This view can be open like any table. I shall be continuing to enhance this ability in future versions. DBF Viewer Plus version 1.75 will be released shortly. I am currently working the next release of MDB Viewer Plus in which I would like it to be more Unicode compatible. For those normal nerds out there on the Interweb that just means have the ability to display data in non European languages. Over the year people have send me sample databases in many languages but unfortunately I can't find any of them. If any users of MDB Viewer Plus have some smallish Access MDB or Accdb files in languages such as Russian, Indian, Chinese, Korean, Japanese, Arabic etc could you please send me a copy to test with? In this release I have altered the table list to open docked to the left side of the screen under the table tabs instead of openning as a floating tool window. This means you no longer have to click stay on top if you wish to keep it open and it doesn't cover the table as the table is then moved to the right of it. 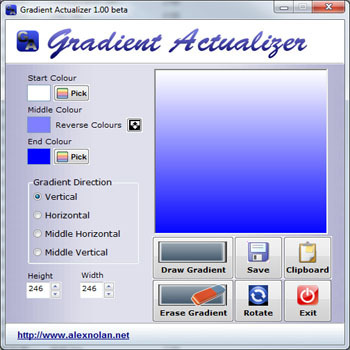 There is also a slider which allows you to resize it if needed. The table list itself has some improvements. There is two additional check boxes to allow you to filter views and / or tables. Under the search menu there is a new feature I'm experimenting with labelled 'Query to side bar'. When selected this will create the query window as an extra tab on the side bar. This enables you to perform a query next to a table or view. If you select the option again it will create another tab. If this feature turns out to be popular and useful I will be making the query window open as tabs along with the tables. This release is a maintenance release which has the following fixes and adjustments. Additional status bar at the bottom display the record count. This record count has been correct when the filter is applied. A general error log has been introduced to capture errors and therefore make future versions more stable. The add table feature has had more error and settings checking along with amend table.